Animation made from images acquired by Cassini on April 12, 2017. Atlas orbits Saturn just outside the edge of the A ring, taking about 14 hours to complete a full orbit. Learn more about Atlas here. UPDATE: Here’s a color image of Atlas made from raw images acquired by Cassini on April 12 in infrared, green, and UV wavelengths. I’ve adjusted it to bring out some surface detail and (hopefully) closer match actual visible light. Color image of Atlas from April 12, 2017. Credit: NASA/JPL/Caltech/Space Science Institute/Jason Major. UPDATE 8-8-18: Here’s another color image of Atlas made from raw images acquired by Cassini on April 12, except this one has been assembled from uncompressed and calibrated raw files so the quality is much better (and hopefully even closer to natural color!) You can find a larger version of it on my Flickr album here. 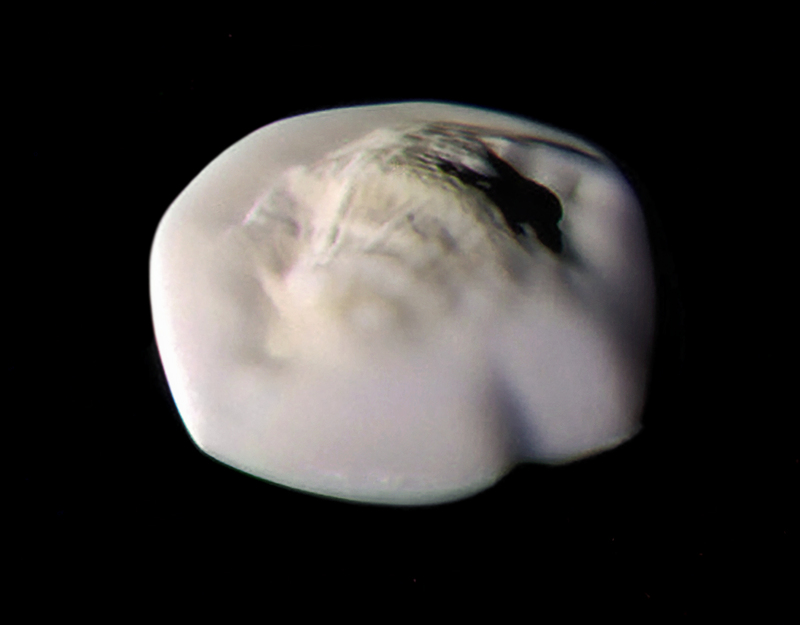 *This is what the moons Atlas and Pan look like today, but their formations may have been the result of low-angle head-on collisions between small moonlets that resulted in ovoid shapes later pulled flat by Saturn’s gravity. It sounds a little far-fetched, but recent computer models by researchers in Bern seem to indicate that as a likely process. Check out the animation below and read more here. Previous Post Worried About Asteroid 2014 JO25? Don’t Be. These pictures have such a surreal, sci-fi feel. I can totally imagine Pan as some sort of gigantic alien civilization, hidden under that stony look.